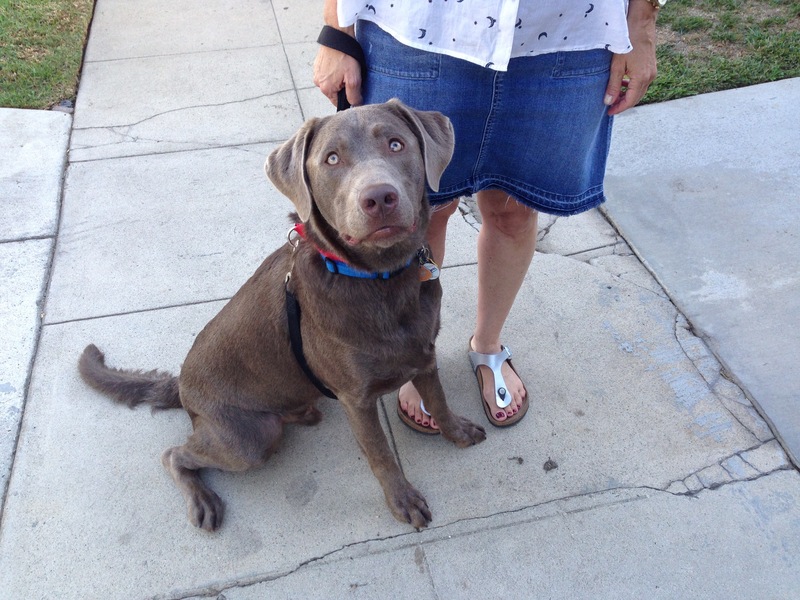 Dodger is a one-year-old Silver Lab puppy in Los Angeles who counter surfs, gets over excited, jumps up on people and doesn’t respect all the members of the family. Now Lab puppies are usually a handful due to their having so much more energy than their guardians. But in this case, the dog may not be as high energy as his family, lol. I sat down with the family to discuss Dodger and how I could help. In the course of our conversation, it became obvious that a lack of structure had given the dog the impression he was equal in authority to all the members of the family. To start changing this dynamic, I made a few suggestions to help the dog see the distinction between human and dog. Adding some simple rules and structure that limit the dog’s access and ask him to stop and control himself will go a long ways towards eliminating many of Dodger’s unwanted behaviors. One of the simplest things the family can do is to pet the dog with a purpose. By asking the dog to sit or lay down, then petting him while repeating the command word, he will be more likely to engage in these behaviors and actions. This way the dog tried to act and behave in ways the humans want because that is how he gets their attention and affection. To stop Dodger’s counter surfing, I went over a method I suggest to clients with this problem. One of my clients was kind enough to share a video they shot of their application of this technique that you can watch on Facebook with this link. I also went over some new ways to communicate Dodger and how disagree with him when he did things they didn’t like. By using body language and movement for these non verbal communication methods and escalating consequences, it will be easier for Dodger to understand them. To help the members of the family practice using these non verbal cues, I went over a leadership exercise I developed a few years ago. After demonstrating it myself a few times I walked the individual members of the family through the exercise starting with the father. The first time the father conducted the exercise he placed the treat on the floor in front of him rather than between his feet. Dogs claim things by standing over them. Because the father placed the treat in front of his feet instead of between them, it wasn’t clear to Dodger that he was to leave the treat alone so he rushed in to gobble it up. After going over how and when to put down the treat, the father took a second crack at the leadership exercise and this time he had better success. While he was able to get Dodger to leave the treat alone, he mixed up a few of these new communication methods; he hissed and stepped forward at the same time. While this works, its not the desired method as I want to eventually have the client only need to use a hissing sound to stop the dog. I explained that he should hiss at the dog when it is approaching the three foot boundary we were establishing. Only after the dog violates the three foot border should the human step directly at the dog in a sudden deliberate step to communicate his movement and presence are unwanted. Next the mother of the family took her turn at the exercise. The first two attempts didn’t go well as her movements were so small and slow that the dog ignored them and instead tried to jump up on her. On the third attempt, I told her to take a sudden step right after she placed the treat on the ground to preemptively disagree with Dodger’s attempt to get the reward. On the mother’s fourth attempt, the dog stayed in place but she took the step forward because I didn’t explain things properly after I had her take that preemptive step. In the future, she should simply stand up and turn her hips and shoulders to face the dog after placing the treat on the floor. If the dog starts to approach the three foot line, then she would hiss and if that didn’t stop Dodger, only then would she step forward to block him. The mother will need to work on keeping her hips and shoulders pointed at the dog at all times when conducting the exercise. She will also need to work on reacting quicker and with bigger, more deliberate movements. Dogs respect these much more than slow and small movements which are interpreted as indecisive. The first few times, the mother almost looked like she was doing the limbo as she was bowing her legs forward to try to quasi-push the dog back. But the way this stepping at the dog technique works best is when the step forward is sudden, confident and deliberate. This movement gives the dog a flinching experience that cases it to back away. This works much more effectively than pushing a dog back as dogs often interpret pushing as playing. As she practices this exercise over the next week or two, her body language should get smoother. She had a little bit of a halting and stiff movement and body posture as the exercise involved a number of small movements and reactions that can be tricky to master at first. Next up was the family’s eldest son Noah. I learned that Noah was not a big fan of Dodger’s at first due to the dog’s unruly nipping and jumping behavior. He made a minor error by hissing at the dog when he started the exercise, but this was due to his parents needing to disagree with the dog as he learned how to run through the exercise. I only use the hissing sound to say “no,” “don’t do that,” or “don’t even think about doing that!” But since the dog stopped himself, no hiss was warranted at that moment. But because Noah did an outstanding job of keeping his hips and shoulders facing the dog with a confident, authoritative stance, Dodger surrendered almost immediately. During Noah’s run through of the exercise the dog moved into the third stage of development; thinking that the human turning to the side and kneeling down meant he could have the treat. Because this was the first time Dodger did this, we didn’t react. But in the future, the proper reaction would be to immediately stand up an turn to face the dog if it starts to get up to take the treat. When this happens, the human essentially resets the exercise and the dog has to lay down again before the human gives it permission to get the treat. I usually test the dog’s resolve when this happens by kneeling down with the treat on my right or left and then pausing for a bit before tapping the floor to give the dog permission to get the treat. Due to my iPhone being low on memory, I wasn’t able to capture video of the family’s youngest boy practicing the exercise, but he must have been paying close attention as he got the quickest reaction from Dodger than anyone. By practicing this leadership exercise daily for the next week or two while making it more difficult by asking the dog to wait longer periods of time before being able to get the treat, they will be able to develop Dodger’s ability to control and restrain himself. Next I had one of the boys go outside to play the part of an arriving visitor so I could show the family how to get Dodger to stay a good five feet away while they answered the door. After demonstrating this myself, we had the boy repeat his knocking so that the mother could answer the door herself in the same way. Because I had just ran through the exercise with the dog, Dodger kept his distance from the door mostly on his own. The mother will need to work on keeping her hips and shoulders facing the dog at all times while she answers the door. As soon as she turns her hips away from facing the dog, the dog can interpret this as no longer needing to stay back. If the dog rushes at the door on future practice attempts, it will most likely be due to the position the persons answering he door is facing. By facing the dog, we can see the instant the dog starts to try to come to the door. Disagreeing with the dog at this instant (by hissing first, then stepping forward if the dog continues) will be crucially important. In time the human will be able to turn their back to the dog when answering the door. But before that can happen, Dodger will need a number of successful repetitions of the guardians answering the door while he stays back. I suggested that the members of the family practice this exercise amongst themselves when returning home over the next week or two. Usually a dog only needs 6-12 successful attempts before dogs start keeping a respectable distance from the door on their own. By the end of the session, Dodger was showing more respect for the personal space of the member’s of the family, was responding to commands and corrections faster and his energy level was nice and calm. Many of Dodger’s unwanted behaviors are related to being a puppy, but that doesn’t meant they can’t be eliminated. The more the dog sees and respects the authority of the members of the family, the less he will engage in these behaviors they don’t like.